If content is king, is video content queen? In terms of content creation, video is in the high echelons of royalty that's for sure. 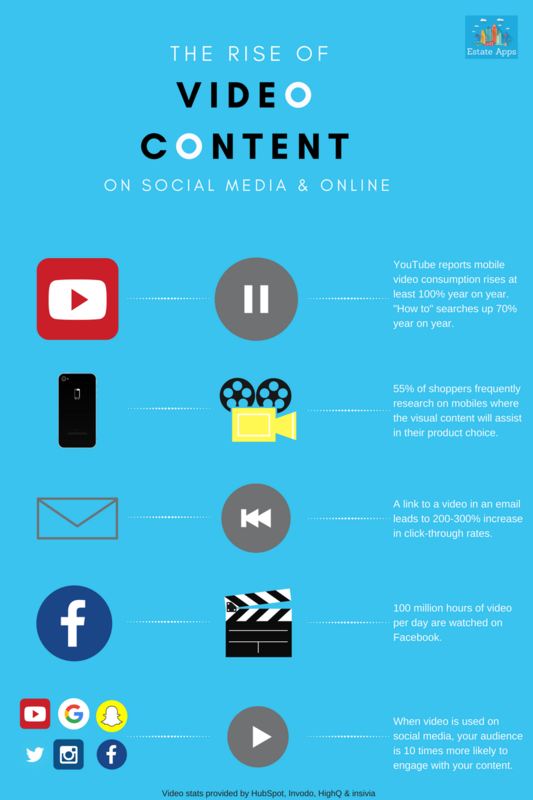 We have produced an infographic to highlight some of the interesting statistics of using video on the web and social media. It’s very clear video views on mobile and desktop are rising each year. As Facebook adds to its number of users, already into it second billion, it stands to reason the number of videos will creep upwards too, and at 100 million video views per day, that’s already a stupefying stat! In turn, the 'How-To' searches on YouTube offer the practical value of video content - seeing something in motion speeds the process of learning, rather than just by reading. Additionally, when attaching video content to your social media posts it will enable your audience to engage with your content in some way, which is valuable because once your video makes an impression (literally) on your audience's timeline, you are 10 times more likely to get either a comment, like or share. Side note: engagement is the quality metric you should be seeking over quantity of followers or post output. How can the stats outlined in our infographic apply to your business? The great thing about video content creation is you're then able to repurpose this content across your other social media platforms or email list. For example if you create a video on how to maintain your garden during the autumn season, you can add this link into your email, take a quote from your video and send on to your email list. The great stat about adding a video link to your email is that there is a 200-300% increase in click-through rates. This will do wonders for your website stats. You can also repurpose the video content further to your social media channels, for example a snippet of the video to your Instagram and Twitter, with a link to your website. The stats show that the rise of video content is in orbit at the moment and steadily rocketing. The negative feedback is that creating video is time consuming and technical. This can be true. But it really depends on what you are sharing. For example with how-to's and a home property tour they can be created on a limited budget, with just a smartphone and a steady hand. If you are filming promotional content for, say, your company website it would be best to seek a videographer. When you have decided on the type of video content you want to share, it is important that you keep to a schedule. If you decide to do a ‘how-to’, how often are you going to be able to offer these? If you say you'll do your how-to's every Monday, you have the remainder of the week to edit, issue in final form and promote. Then prepare for the next one. You have to be realistic with your timescale. To be super-organised it's best you give yourself enough lead time, so create a few videos first before you say you're going to 'launch' your how-to's, otherwise you will find yourself chasing your tail and under pressure. Organise a calendar with the content you want to share with your clientele, then you can visually see and map your time. The calendar can be your work calendar, a spreadsheet or a tool like Asana or Slack - find what works for you and your team. Keep in mind ‘awareness’ days that you could build your content around such as National Home Security Month is in October, or even if an awareness day is noted globally you may need to pause your video schedule for the day as your content may get lost in the support of the awareness day. We hope you found this blog useful, and if you do please let us know your comments or share with the links below. Let us know how you get on with your video content creation and strategy, and lastly do share with us your videos, we can’t wait to see them! *statistics provided by HubSpot, HighQ and Insivia.